Well, I was wrong. Six months ago I made the point, following the collection of my first pair of shoes from Cleverley, that the benefits of bespoke shoes were more about comfort than aesthetics; in contrast with a bespoke suit, where the benefits are more in how it makes you look. You can see why it makes sense. 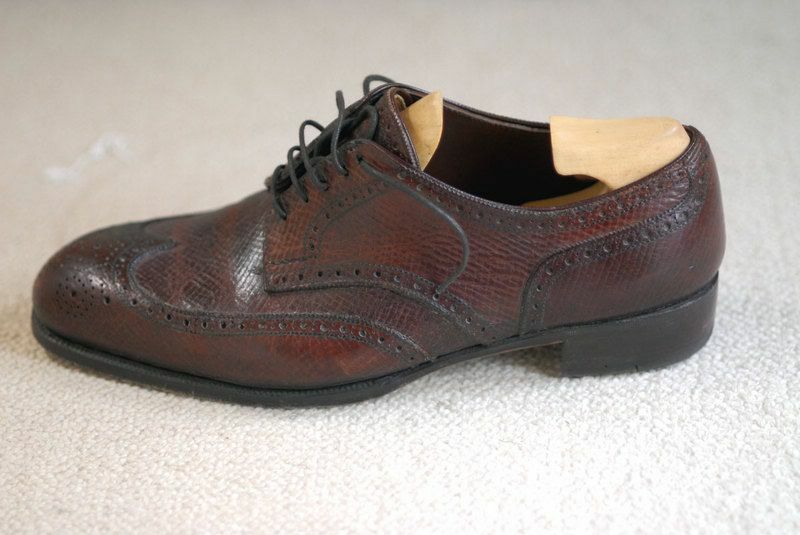 The aesthetic improvements in a bespoke shoe are more subtle than those of a suit. The closely cut waist and gently pitched heel don’t grab everyone’s attention; but a bespoke suit makes you look leaner, stronger and taller to everyone, instantly. Regarding comfort, a bespoke suit can help with its high armhole and correctly cut trousers, but the difference over ready-to-wear is not as marked as with bespoke shoes, where your ankle is held precisely and every joint subtly shaped around. So much more pressure goes onto your feet and so much more pain can result. Yet while my Cleverley shoes certainly fit better than any ready-to-wear, the thing I can’t stop admiring is the aesthetics: that line through the waist and instep, the way the heel segues into the heel cup; it makes the whole shoe seem much more delicate and refined. When I look at old pictures of movie stars in the 1930s, my eye now often goes first to their feet, to see if I can spot that slender arch and pitched heel. It looks particularly good on men from that era, who often wore wider trousers that dropped straight from the natural waist. That long, wide leg makes the shoes seem more delicate still, almost hidden save for the narrow heel and elongated front. Of course, there are things about my Cleverleys that I want to, that I will, change. Such is the curse of bespoke: nothing is ever quite perfect, or not for long anyway. Aesthetically I should have gone for a deeper brown leather; this one was a little too reddish. I might also have matched the line of brogueing across the toe cap with another line elsewhere. In terms of fit, they are a little close on my little toes, particularly on the right foot. You could also tweak the height of the vamp just above the right toe. The great aspects of the fit barely need repeating, but those I notice most are the tight hold around the ankle and heel, which removes any chance of rubbing and allows the front of the foot to flex freely, and the adjustment for my low instep, which permits more purchase with the laces than any ready-to-wear pair. These benefits come to the fore after a long day’s walking – a day in Paris with a surprising number of cobbles springs to mind – when the back half of the shoe clings resolutely to the foot and there are no signs of friction, anywhere. Improved fit and longevity have to be worth something for you to spend more than £2000 on a pair of shoes. After all, most of the aesthetic aspects can be approached by high-end ready-to-wear shoes or cast-off bespoke pairs (like my other Cleverleys). But for the moment, all I can do is stare at that beautiful, sculpted waist. You can follow the discussion on Bespoke shoes at Cleverley 13: The wear report by entering your email address in the box below. You will then receive an email every time a new comment is added. These will also contain a link to a page where you can stop the alerts, and remove all of your related data from the site. Looks to be excess leather in the top picture where the shoe is being pulled up from the toe. Deep and heavy creasing. May be different if photographed just standing of course. That’s purely a result of the shoe not having the sole on at this stage. Also, the lasting was tightened slightly across that area later, after the first fitting. Have a read of the series (top link in this post) to get the background. I must say I disagree. The primary benefit of a bespoke suit is fit, then fit and finally fit. That means comfort. But then of course: the improved fit, comfort and well being automatically result in a better look (aesthetics). Conclusion: a bespoke suit is a win / win situation! If you have a look at the work of the french shoemaker Anthony Delos, you will see that bespoke shoes (with unimaginable lines for RTW) can easily surpass any high range RTW shoes. Same thing for the work of Dimitri Gomez. You know the saying “as comfortable as an old pair of shoes”; well my 8 year old bespoke Cleverleys were just as comfortable on the day I first wore them. I am with you on the comfort side of the comfort/appearance scale. A current photograph (showing the shoes after six months of wear) would have been appreciated. Maybe Simon might post an image of his shoes, but this link shows my Cleverley Russian Reindeer hide brogues after 5 years. Have you found it necessary yet to have any of your bespoke shoes resoled and if so how has that worked out? I have found on occasion that when resoling RTW shoes, they are left with a strip of leather at the edge (above the stiches) which does not bond with the shoe and flaps around in a rather ugly look that one does not get with a new pair of shoes. This has over the years happened to me on a few occasions and with more than one maker, I wondered if this occured with bespoke shoes as well. After reading rave reviews and articles of bespoke shoemaking, especially with Cleverley, I jumped right at it and ordered my first pair last September. Last week, I received the completed shoe and my feedback is not what I expected. In the reviews, every writer wrote about their shoes fitting like a glove right from the first fitting with a few needing only very minor tweaks and perfecting the fit at the second fitting. Unfortunately, this hasn’t been the case for me. I’ve had three fittings and even with the shoe completed, it’s not comfortable with many pressure points and blisters occurred. I just wanted your advice if this is normal for some customers and it probably takes more time for some to perfect the fit? I would appreciate any advice you could give as I really would like this to work. It’s really hard to say without seeing the shoes and your feet. And they can of course take a little while to wear in. But it does sound worse than what you would expect. I would make sure they know exactly how the fit feels, don’t pretend otherwise, and see if it can get to an acceptable level. It’s certainly the case that bespoke rarely fits like a glove with the first pair.